(April 26, 1785 – January 27, 1851) was born in Les Cayes, Saint-Domingue, the current Haiti, and was the “illegitimate son of [a] merchant, planter, and slave trader”[i] and a Creole woman. He was first named Fougère Rabin, or Jean Rabin, but he and his half-sister were legalized by adoption in 1794 and sent to France. His origins therefore resemble those of Alexandre Dumas, père, the immensely popular author of the Count of Monte Cristo, The Three Musketeers, and La Reine Margot (Marguerite de Valois who was married to Henri IV against her will) and other historical novels. But there is a difference. Financially, Dumas did well early in his career, but John James Audubon’s art did not bring him money until later in life. At the age of eighteen (1803), his father sent him to United States where he had a property near Philadelphia. As a result, Jean-Jacques avoided conscription. To what extent John James looked after the property is difficult to assess. He sold that property in 1807 and the following year, he married Lucy Bakewell. The couple moved to Kentucky, but during his stay in Philadelphia, Audubon had become very interested in ornithology, the study of birds, and had started honing his skills as an artist to become one of a most revered bird-artists. Sadly, before drawing the birds of America, he killed them and ran a wire through their body so they would look alive. They posed. He is said to have boasted that he studied art with Jacques-Louis David (30 August 1748 – 29 December 1825), probably the finest among artists who survived the French Revolution. This may not be the case, but it doesn’t matter since Audubon’s own art reveals considerable artistry. He used pastel, watercolour and oil. [ii] Moreover, Audubon was both an artist and an ornithologist but, it would appear, the better artist. After declaring bankcruptcy, he travelled up the Ohio and Mississipi Rivers in search of birds. He wife was tutoring and whenever he came to a town or village, he would do portraits, which provided him with the money he needed to identify and make paintings of all the birds of America. It was an extremely ambitious project which he completed successfully. He and his wife moved to New Orleans c. 1821, in the former Louisiana, a French colony sold to the United States in 1803. Shortly thereafter, he travelled back to Europe, exhibited his work and looked for an engraver. The engraver he hired was Robert Havell 1793-1878) and, in 1827, the first (4 vol. 435 hand-coloured plates) of the 87 portfolios that would eventually constitute the depiction of 1,065 birds was published. With the assistance of Scottish naturalist and ornithologist William MacGillivray, Audubon also published “an accompanying text,” his Ornithological Biography. John James found sponsors and patrons in Europe, including the king of England. Yet by now he had spent a fortune having his artwork put into book form. He therefore published a less lavish and shorter Ornithological Biography, 5 vol. (octavo, 1831–39). A Synopsis of the Birds of North America (1839), which served as an index. Audubon was then able to return to the United States and settled in a “spacious” house on the Hudson River (Manhattan, New York). There he prepared a smaller edition of his Birds of America, 7 vol. (octavo, 1840–44). However, his work was not over. He illustrated the Reverend John Bachman‘s three-volume The Viviparious Quadrupeds of North-America (1845-1853), which his sons completed. 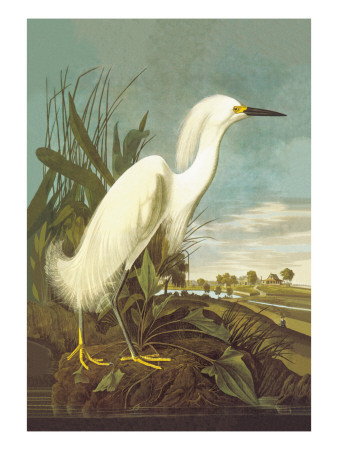 John James Audubon died at the age of 65. Fifteen years later, in 1866, the National Audubon Society was established. According to Richard Rhode, quoted in Wikipedia, John James truly loved birds: “I felt an intimacy with them…bordering on frenzy [that] must accompany my steps through life.”[iii] The Wikipedia entry also reveals that he attended military school during the years he lived in France and that his father had owned a sugar plantation in Saint-Domingue, the current Haiti. In so many areas, the internet is a miracle. For instance, one can see in a wealth of details many of Audubon’s paintings of birds. As well, the National Audubon Society sells an Audubon calendar that not only keeps a person up to date, but does marvels for the decoration of one’s kitchen. The Society also provides information on bird sanctuaries and has a little marketplace. [i] “John James Audubon.” Encyclopædia Britannica. Encyclopædia Britannica Online. Encyclopædia Britannica Inc., 2012. Web. 11 Mar. 2012. <http://www.britannica.com/EBchecked/topic/42629/John-James-Audubon>. [ii] “John James Audubon,” Chambers Biographical Dictionary, 7th edition (Edinburgh: Chambers Harrap Publishers Ltd, 2003) p. 80. [iii] Richard Rhode, John James Audubon: The Making of an American (New York: Alfred A. Knopf, 2004), p. 4. <http://en.wikipedia.org/wiki/John_James_Audubon>.